Oh brave new world, which has such physicists in it! The problem we now face is that there is no longer an obvious piece that’s missing, but there are still many unanswered questions, which means we have to move from an era of a well constrained search to an era of phenomenology, or looking for new effects in the data. That’s not a transition I’m entirely comfortable with for several reasons. It’s often said that nature is not spiteful, but it is subtle and indifferent to our expectations. 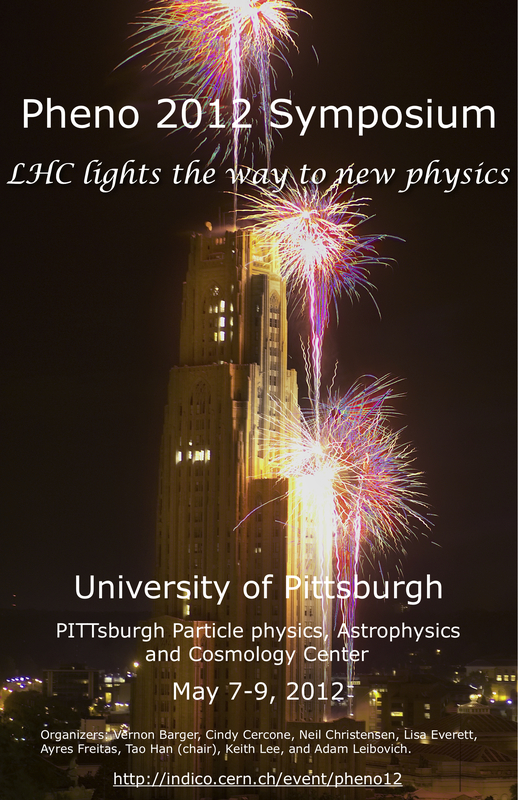 There’s no reason to think that there “should” be new physics for us to discover as we increase the energy of the LHC, and we could be unlucky enough to not find anything new in the Run II dataset. A phenomenological search also means that we’d be overly sensitive to statistical bumps and dips in the data. Every time there’s a new peak that we don’t expect we have to exercise caution and skepticism, almost to the point where it stops being fun. Suppose we find an excess in a dijet spectrum. We may conclude that this is due a new particle, but if we’re going to be phenomenologists about it we must remain open minded, so we can’t necessarily expect to see the same particle in a dimuon final state. It would then be prudent to ask if such a peak comes from a poorly understood effect, such as jet energy scales, and those kinds of effects can be hard to untangle if we don’t have a good control sample in data. At least with the discovery of the Higgs boson, the top quark, and the W and Z bosons we knew what final states to expect and what ratios they should exhibit. There’s also something a little unsettling about not having a roadmap of what to expect. When asked to pick between several alternative scenarios that are neither favoured by evidence nor disfavoured by lack of evidence it’s hard to decide what to prioritise. On the other hand there is reason to be excited. Since we don’t know what to expect in LHC Run II, anything we do discover will change our views considerably, and will lead to a paradigm shift. If we do discover a new particle, or even better, a new sector of particles, it could help frame the Standard Model as a subset of something more elegant and unified. If that’s the case then we can look forward to decades of intense and exciting research, that would make the Higgs discovery look like small potatoes. 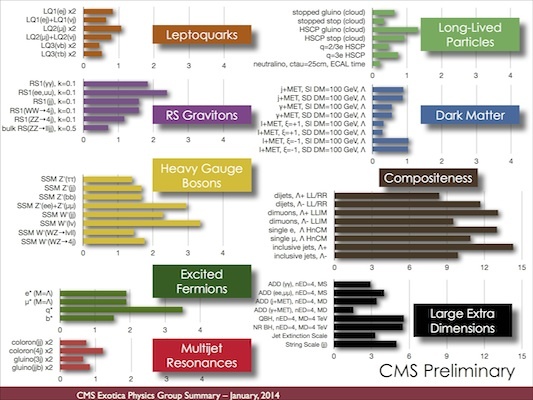 So the next few years at the LHC could be either the most boring or the most exciting time in the history of particle physics, and we won’t know until we look at the data. Will nature tantalise us with hints of something novel, will it give us irrefutable evidence of a new resonance, or will it leave us with nothing new at all? For my part I’m taking on the dilepton final states. These are quick, clean, simple, and versatile signatures of something new that are not tied down to a specific model. That’s the best search I can perform in an environment of such uncertainty and with a lack of coherent direction. Let’s hope it pays off, and paves the way for even more discoveries. My goal for part 1 of “Paper vs. Protons” is to give an intuitive picture of how we generate electron (e-) & positron (e+) pairs when we physically collide two protons. Hopefully, the images are detailed enough so that you don’t have to read the text to understand what is happening. The words are there mostly for completeness. Figure 1: A quark (q) & an anti-quark (q-bar) with equal and opposite charges combine and become a photon (γ). The photon then decays into an electron (e-) & a positron (e+). My colleague/fellow blogger Flip Tanedo has already done an awesome job describing Feynman diagrams, what they are, how they work, and why physicists love them so much. I do neither him nor Feynman justice when I say that the diagrams are simply ways for anyone (not just physicists!) to intuitively visualize how two or more pieces of matter can interact. The point I want to make with figure 1 (above) is that one way we can produce an electron and a positron pair at the Large Hadron Collider (LHC) is by having a quark from one proton and an anti-quark from another proton smash into each other and become a photon (γ). This photon then travels for a very short amount of time (and I mean very short) before it decays into an electron (e-) and a positron (e+). This process can also happen if we were to replace the photon (γ) with a related particle called the Z boson. You can forget about the Z boson for now, though we will need it for the very end of the post. At the Large Hadron Collider (LHC), we are colliding protons (left black circle) with other protons (right black circle) in order to look for new physics. Figure 2. Two protons (black circles) are moments from colliding. We learned a while back ago that the proton is primarily composed of two up-type quarks and one down-type quark. The proton is also made up of something called “gluons,” they help mediate the Strong nuclear force. Gluons are emitted and absorbed from quarks at such a fantastic rate that the proton is ostensibly made of three quarks tied to one another with rigid rope. The three quarks are represented by the red/blue/green circles and the curly lines are the gluons. and virtual particles (black circles). In the image right above you might have noticed that there are small little black circles, these are virtual particles. Quantum Mechanics and Special Relativity tell us that if we have enough energy, then matter can spontaneously form for a short amount of time. These could be muons (my personal favorite) or even other quarks. So long as matter and antimatter are produced in equal amounts all is well in the universe. Things get interesting when these virtual particles are produced right before two protons collide (below). Figure 4: Two protons are about to collide right after an anti-quark (magenta circle) and its quark partner (not shown) were produced. If, for instance, an anti-up quark (the magenta dot in the left circle, above… I did not come up with the color convention but I do like it.) were to form, it could then collide with a u-type quark from an oncoming proton (green circle in right circle, above) and become an photon. Jumping now to the image below, we can imagine the photon being that little black dot in center of the two incoming protons. 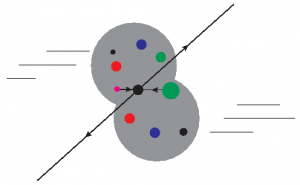 Figure 5: Two protons (gray circles) are about to collide resulting in an up quark (green circle, right) & an anti-up quark (magenta dot, left) becoming a photon (black dot, center), and decay into an electron & positron (two outgoing arrows). If we now zoomed in on the collision (below), we would see the two protons physically overlap when they collide and it is at this moment the quark and its anti-partner combine to become a photon. I have removed the gluons just for clarity. Trust me, they are still there. 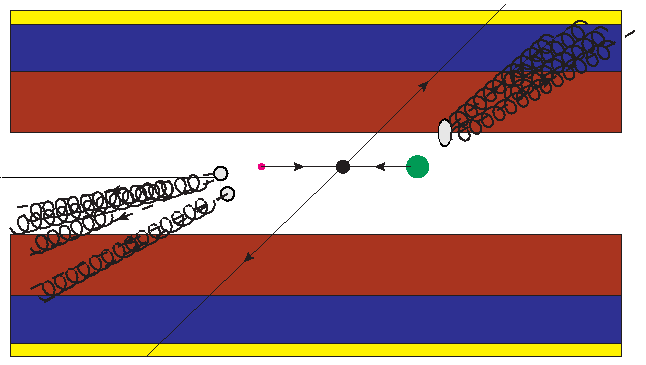 Figure 6: Two protons (gray circles) are about to collide resulting in an up quark (green circle, right) & an anti-up quark (magenta dot, left) becoming a photon (black dot, center), and decay into an electron & positron (two outgoing arrows). Here is where things get messy. Imagine a firework exploding and fragmenting into a bunch of small pieces. Well, that is not too different from when two protons collide; they just kind of explode when they smash into each other while traveling at 99.99999% the speed of light. In the image below I left the q q-bar → e+ e- diagram in order to give you an idea how the protons, or what were formerly known as protons, fragment and decay. The dashed arrows should give you an idea of how they fan out. 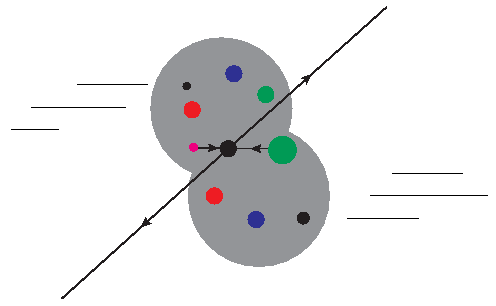 Figure 7: Post collisions, the remnants of the two protons begin to fragment and decay. 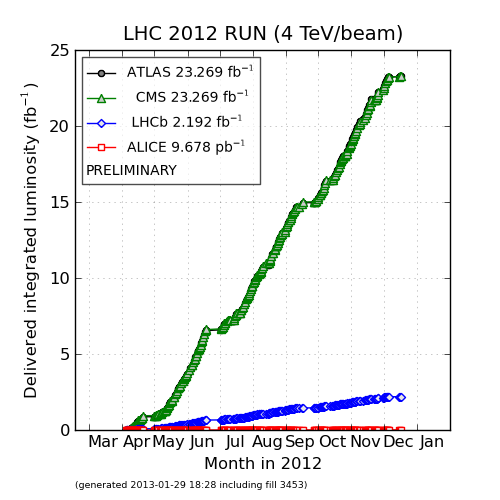 Okay, let’s zoom all the way out because this is all happening in one of the LHC detectors! Figure 8: How the q q-bar → e+ e- + fragmenting protons might look in a particle detector. The different colors represent the different layers in a collider detector. The beam travels horizontally through the center of the white region. So one proton enters from the far left and the other proton comes from the far right. Again, the q q → e+ e- diagram has been left as a reference. After the two protons collide, an electron travels one way (long back arrow) and gets stopped pretty early. In a similar fashion, the positron heads out in the opposite direction from the electron in order to conserve momentum (the other long black arrow). The remaining proton fragments continue to decay and just start spewing out particles. The neatest thing about everything above is that we observe this stuff all the time at the LHC. Sadly, I could not find an event that matched our process perfectly. 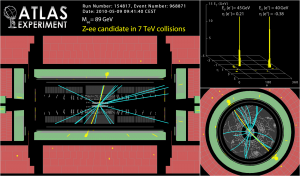 I did, however, find an real life event (below), seen with the ATLAS detector, where a quark and an anti-quark become a Z boson (Remember? Like a photon but heavier.) which then decays into an electron and positron (yellow lines). The remnants of the protons can be seen in teal. 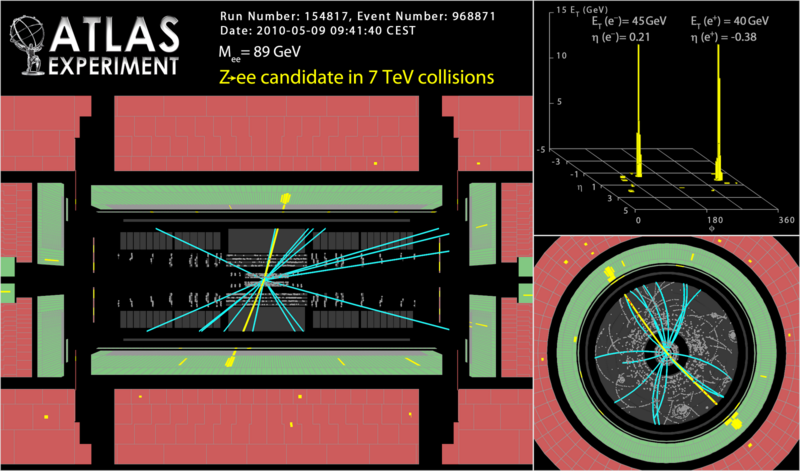 ﻿ Figure 9: A real q q-bar → Z → e+ e- from proton collisions at the LHC, seen with the ATLAS detector. Click on image for high-res version. The e- and e+ can be seen in yellow and proton fragments in teal. I had a blast writing this post, even though I had a few WordPress issues. So what do you think? Cool right?